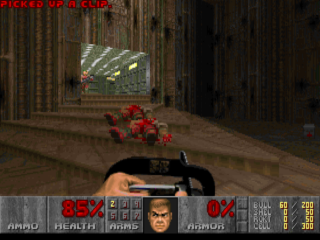 Prboom is a opensource enhanced doom engine. Picklelauncher is closed source (for the moment) frontend for command line applications. Hmm, didn't get the resolution right. Hmmm. Having trouble launching this little baby. I like Doom too. Aah. I've sussed it. Just place the iwad folder and its contents in the same folder as prboom. It plays superbly. The blocky resolution of Doom on a pc screen suits the Caanoo perfectly. It's as smooth as one of my chat up lines. The sound is superb. I love my Caanoo right now. Thanks pickle. Great engine, the 2D objects filtering is very well made! Strange. I placed the iwad folder with some wads inside the prboom dir. I can load the doom1.wad shareware file but not the free software ones like tnt.wad or plutonia.wad. Did someone try? You can only switch between the two most powerful weapons, Next weapon and Prev Weapon doesn't seem to be implemented in this port yet. Runs perfectly on my caanoo. Though I have a suggestion for the button mapping. I have mapped strafe left and right to the L and R buttons, toggle run to the II button, shoot with X, open doors with A, switch weapon with B. It takes some getting used to, but it will make it a lot easier to dodge attacks. So is there actually no button mapping to change weapon in this version? Just one to switch to best weapon?